This design has helped to pave the way for other internal bifolding door systems. 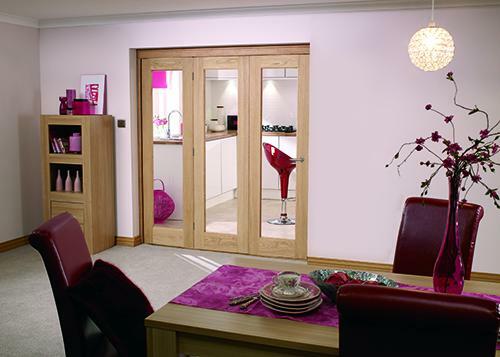 Our glazed roomfold door set is our most popular internal folding door system by a country mile! Boasting a sleek design with perfectly glazed panels and super-smooth tracking, there’s no better way to update the look of your home. This roomfold system is available in 3, 4, 5, or 6 door options and three different door widths, allowing you to build the perfect system for your home. This flexibility ensures that the doors fit perfectly with no planing required on site. We always recommend reading the installation details in full before installing the doors. As with all of our folding door offerings, the glazed oak P10 roomfold set runs of a top-hung system which requires no tracking at floor level. The frame packs are always supplied in unfinished oak to allow you to choose the stain or paint colour to match your existing skirting boards and architraves. Please note that these doors are supplied unfinished and therefore require you to add your own stain or paint finish prior to installing the doors. All doors are provided without handles or drop bolts to allow you to match existing ironmongery in your home.